So another month, another EP. I was recently asked by a Brainlove colleague whether I had finished ‘this week’s album’. I always remind people that Hunky Dory, Ziggy Stardust, and Aladdin Sane all came out within a two year period. Less than an album a year is just plain lazy. It’s only with hindsight that the PWL ‘back catalogue’ looks hugely prolific, mostly I was doing one EP of six or seven tracks, including some instrumentals, each year. It was only in around 2004 that I began banging them out like Robert Pollard collaborating with Jandek. 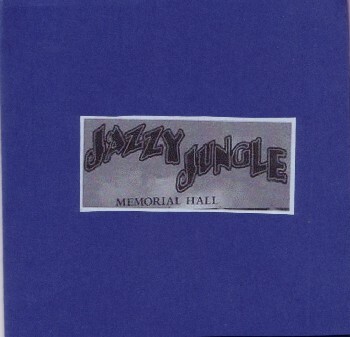 That period began with this month’s reissue ‘Jazzy Jungle Memorial Hall‘. It’s somewhat of a favourite of mine, if I was going to recommend only two of the reissues to bother with it would be this one and ‘Build Library Here (or else!)‘. Written and recorded entirely from scratch in May-July 2004, immediately after I finished my first album. Most of the songs would have been done in a few hours. Mixed ‘live’ and mastered at the same time. I wasn’t one for going back and editing in those days. The only one I remember making any changes to at all is ‘My Victor’ where I re-did a piano part. The title comes from a children’s centre in Llandaff. My then girlfriend (now wife) discovered it whilst out for a walk and I liked the incongruity of the two phrases together. ‘Memorial Hall’ the song would come the following year, after seeing lots of them on the west Wales coast. Already having an EP with that name meant it stuck in my head. At the time it was just a name. Musically it’s still relatively light on electronics, apart from the beats and a keyboard or two. Ramshackle but starting to get to grips with the technology I was using at the time, limited to eight tracks and no ability to slice & dice takes. Lyrically it marks the start of a more literal approach to writing about Politics And That. 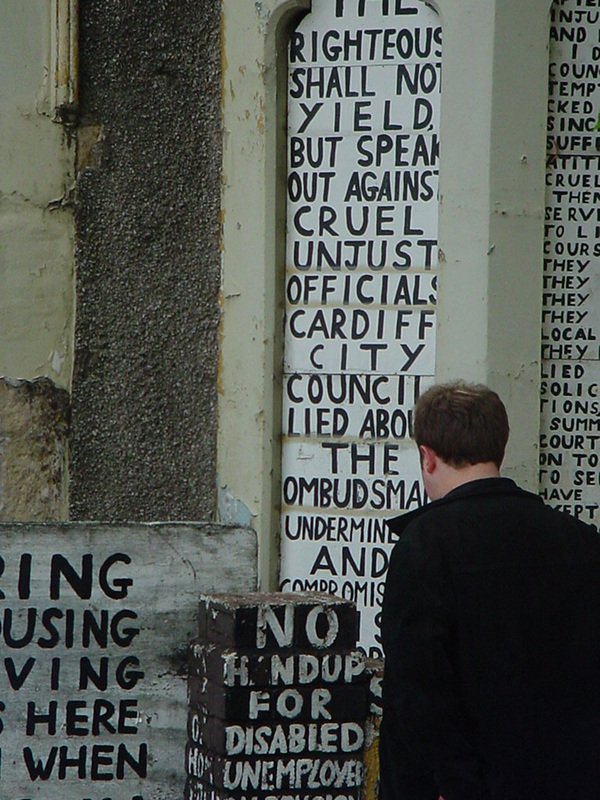 Picture used on the back cover - the famous protest house in Riverside, Cardiff. The song that got me signed to Brainlove Records when I made it part of my demo in 2006. John Brainlove still prefers this mumbly rough version to the later ones. I’ve told this story many times, but here goes again… The song was inspired by Captive State by George Monbiot. A book which describes the immense idiocy and wastefulness of the Private Finance scheme in public services. In the epilogue he acknowledges how boring the book is, despite being on an important subject. So ONHS was my attempt to re-write his boring ideas into a more accessible format of a 3 minute pop song. Another song in a similar vein. The title clearly a pun on ‘Coffee and TV’ by Blur which had been wibbling in my head since I was in school. Inspired by my experiences working in a government office at the time, and the clear difference between that and the ideological wonderland I was simultaneously watching in the West Wing DVD boxed sets. Could update it if anyone can think of a pun on ‘Ban Ki-moon’….? This is part two of a three part kitchen sink drama of songs. I actually won’t say what they’re about as I think they unfold nicely on their own. Part one is ‘Molly’s Lips’, and part three is ‘At the hairdressers…’. All of these songs were written and released about a year apart which tallies fairly nicely with the events in question. Musically this is straight guitar pop. I had vague aspirations that it would sound like ‘Buttons and Zips’ by Elbow, but it really doesn’t at all. This took a very short bus journey to write and probably half an hour to record. Done spontaneously one day after work. It’s sort of like an old gospel blues thing. Written from the point of view of someone in a developing world giving their opinion on the effectiveness of ‘trickle down’ economics. When you put it like that it doesn’t sound as much fun…. My attempt to be a bit Tom Waitsy, a reasonable success. Thankfully I didn’t attempt the voice, instead opting for a slightly pitch shifted croon. It’s long and rhythmic and yes it has bongos on it. Sorry. Lyrically it concerns the anxieties of manning a Samaritans-style listening line, which I have some experience of. Like ONHS this was re-recorded two years later with Napoleon IIIrd for ‘The Independent Scrutineer’ and despite not really removing anything from the structure we managed to chop about 4 minutes off the running times, not entirely sure how. This version is looooong and features me drumming somewhat ineptly on a child’s toy drumkit. The song itself pretty much came to me out of nowhere as I descended the cliffs of an isolated south Wales beach. Perhaps someone was trying to tell me something from the beyond? One of many many many songs about death. The one most specifically about my own. One day I’ll do a nice re-recording of it that can be played at my funeral. It’s all churchy organ and slowness. Not much more to add. You all know the drill by now. I’m doing these as pay what you like. Plenty of you are paying and I appreciate it. You’re helping to fund the mixing of a new record. This entry was posted on March 22, 2011 at 12:19 and is filed under PWL News, Releases. You can follow any responses to this entry through the RSS 2.0 feed. You can leave a response, or trackback from your own site. Yeah, can’t really just write someone else’s song again though…. How about ‘Ban Ki in the Moonlight’? I was going to suggest We’re Off To Ban Ki Moon, but I’ll probably have to go to hell now.